Today I'm excited to let you know about a new thing that Martha Stewart is launching on her blog called, "Books I'm Reading". As part of the Martha Circle, Jordan from Oh Happy Day, Jane from This Week For Dinner and I will be reading Martha's picks along with her on these awesome little pocket-sized Sony Readers they sent us. 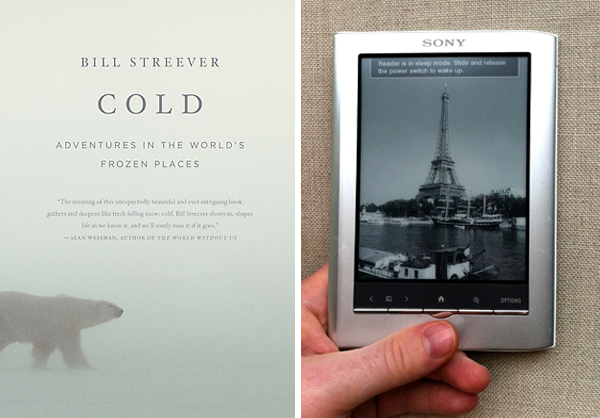 This month, Martha selected the book Cold: Adventures in the World's Frozen Places by Bill Streever. Streever is a biologist who writes about his experiences in the some of the most freezing environments in the world. It makes me shiver just thinking about it! I am fascinated by what he has to say about animal's hibernation habits, and the way the human body reacts in such extreme bitter-cold conditions. So far, it is very intriguing. The Sony Reader they sent is really cool -- it feels natural and convenient because it is smaller than the size of a normal book and can easily fit in your bag, or even pocket. What differentiates it from most e-readers out there is that it has a full touch screen and you can also download books from participating local libraries and Google to get over 1 million classic books for free, so you really have a lot of options. Bonus for you readers is that you can enter to win a Reader for yourself here where one winner will be selected each week! Be sure to also tune into the Martha Show on Monday, December 6th where she will be interviewing author Bill Streever. Happy reading everyone! Did you know that public libraries are increasingly able to loan e-books (and audio books) out digitally? The selection is small but growing, and like regular books, libraries are only able to offer a limited number of downloads at any one time. People download the texts to their readers via their home computers. The files expire and disappear on the "due date." I have free software on my iPhone called Stanza. There are some free books, mostly classics, but I would love to have more. I will talk to my library. Conhece esse site www.iloveshopping.com.br? Blog de tendências e novidades a preços baixíssimos só para você, siga nos e concorra a promoções.